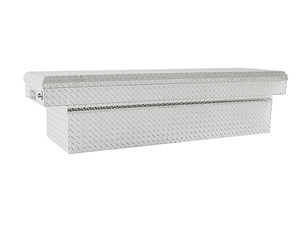 1718010 by BUYERS PRODUCTS - Aluminum Silver Slide Out Truck Bed Box 9 x 48 x 20 in. 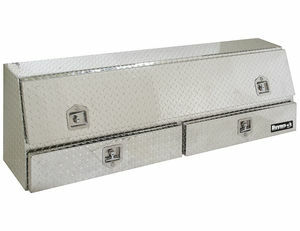 Aluminum Silver Slide Out Truck Bed Box 9 x 48 x 20 in. Uniquely movable "long" supports, and “small” partitions are included for ultimate customization. Additional “small” partitions can be purchased for further customization. 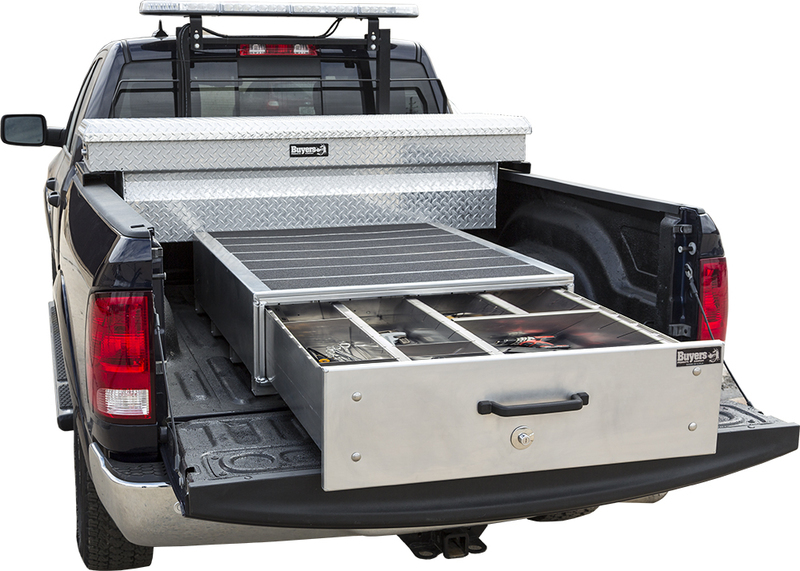 The Slide Out Truck Bed Box's heavy duty reinforced aluminum construction lets you load up to 800 lb (evenly distributed) on top. 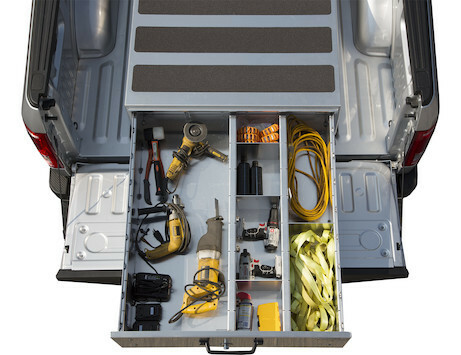 The bed box's drawer will hold up to 500 lb of tools and/or equipment, keeping your space organized and clutter-free. The box's uniquely movable partitions and dividers can be positioned to accommodate your storage needs. 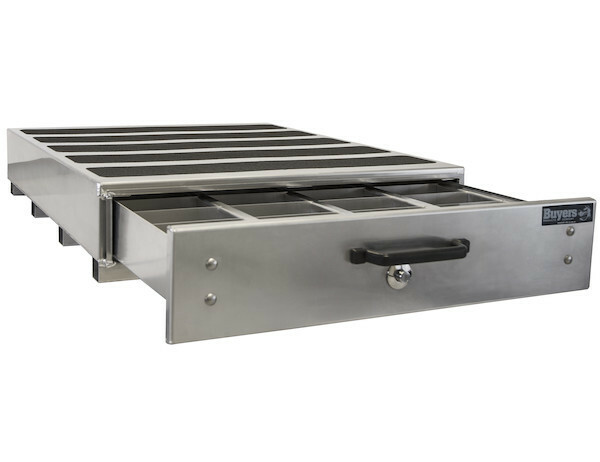 The drawer slides over high capacity steel rollers and automatically detents into a locked position every 8 inches for convenience and control, and releases easily with the push of a button. 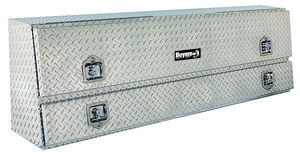 At Buyers Products, we offer the widest range of contractor-grade slide out truck bed boxes in the industry. 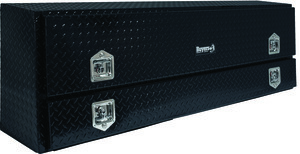 Our slide out bed boxes are designed to help protect, secure, and offer easy access to your valuable tools and equipment. 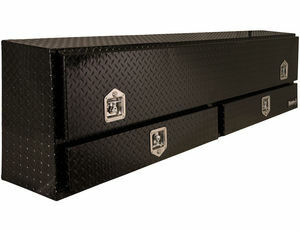 Built with pride in Ohio, our truck boxes are rugged, durable, and can tackle anything you can throw at them. Constructed from the highest quality materials, our slide out truck boxes are made to survive in the toughest environments. No matter what your storage needs are, Buyers Products has the right truck box for you. 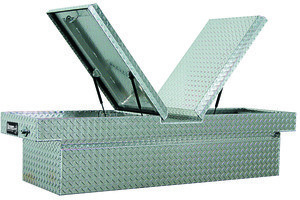 Buyers Products' line of slide out bed boxes are made from heavy-duty reinforced aluminum and built to last. We engineer and build each of our boxes to tackle the rigors of daily commercial use. With Buyers' industry-leading customization and movable dividers, our boxes will accommodate most tool and hardware configurations. Each box has a locking push button with key to protect your investments, and a full door gasket and rain gutter for four-sided protection against the elements. Every box comes complete with vertical dividers, mounting hardware and predrilled mounting holes. 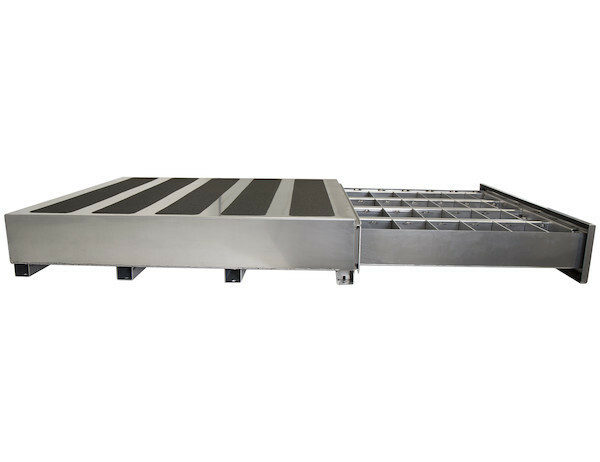 Additional 16-piece horizontal divider kits are also available for further customization. 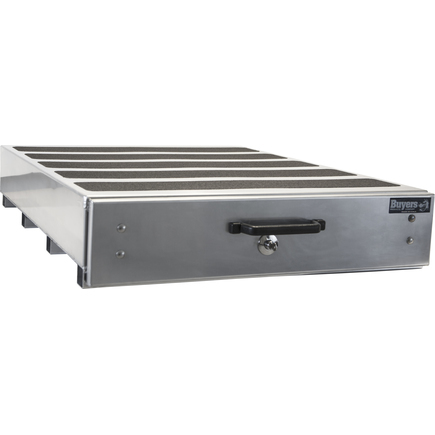 Heavy-duty reinforced aluminum box and drawer construction. 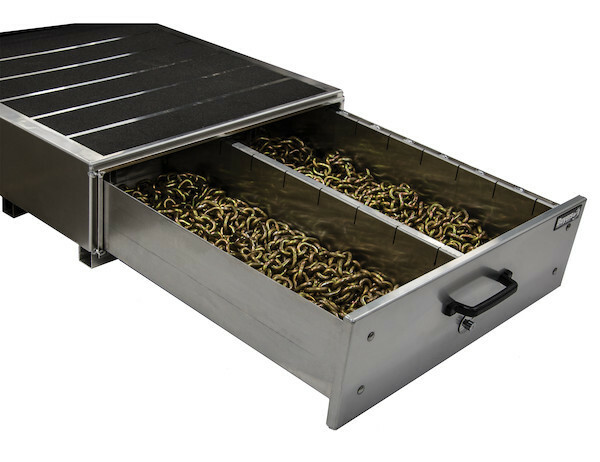 The drawer automatically detents into a locked position every 8 inches for controlled motion, convenience, and safety. To release, simply push the drawer button. (optional horizontal dividers shown). 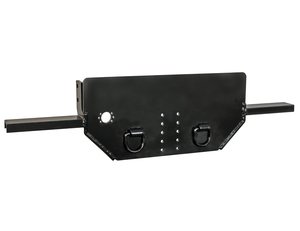 Our drawers support an industry-best weight capacity of up to 500 lbs. and you can load up to 800 lbs. on the top of the box (evenly distributed). We also include anti-slip tape on the top of each box to provide traction for work boots. Full customization is available with Buyers included movable dividers kits. These kits allow you to quickly change your bed box configurations to fit your immediate needs. 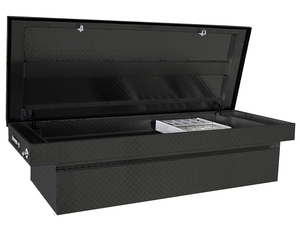 Each bed box drawer is engineered to operate smoothly and promises years of dependability. 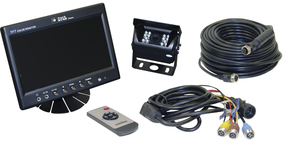 Every Buyers slide out truck box operates with a lockable push button to protect your valuable investments. 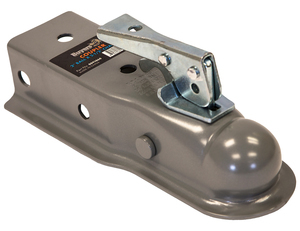 All Buyers slide out truck boxes come with mounting hardware, and pre-drilled mounting holes. 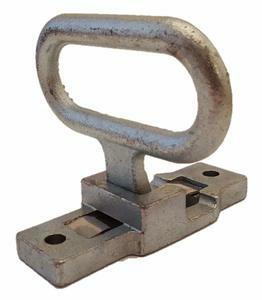 This allows for easy mounting in your truck or van.